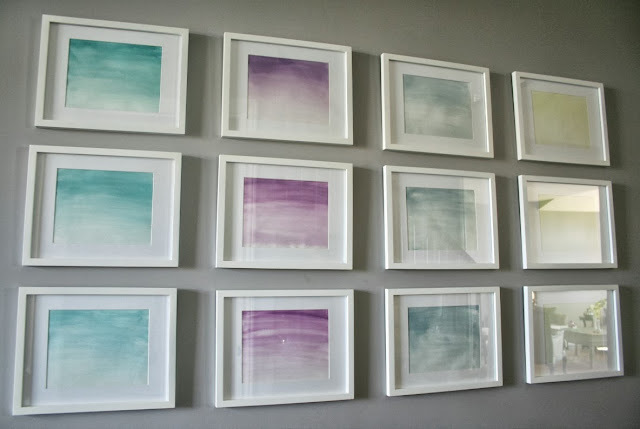 elliven studio: DIY: Ombre Watercolour Gallery Wall. How You Can Easily Achieve This Look. 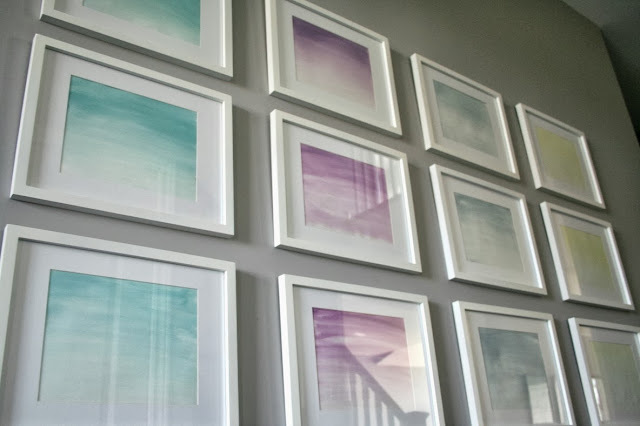 DIY: Ombre Watercolour Gallery Wall. How You Can Easily Achieve This Look. So, a little while back I finished the DIY gallery wall in our main hallway. I know I really like something when I don't have the urge to switch it up a week later. I smile when I see the 12 little paintings hanging there. They fit the wall perfectly. So, how'd I do it? First off, let me say this. I'm no painter, not at all. What I am is someone who gets ideas of what she wants and when I can't find it in store/online, I do my best to create the look myself. This project included a lot of trial and error. It did take some time simply because I needed to create the colours for each row. I knew the palette I wanted, but had to mix the paints myself to get the perfect colour. When choosing the colour palette, be sure to look around the rest of the space and pull your colours from there to ensure a cohesive look. 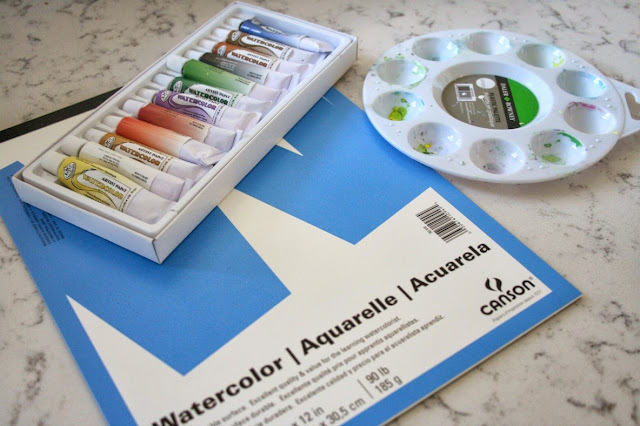 So you have your paint & paper, now what?! To be honest, I literally wet the sheet of watercolour paper, took my paint colour and used long strokes going from one side of the sheet to the other horizontally, starting at the top of the sheet. I overlapped the rows ever so slightly and continued my way down the sheet. If the colour was too intense, I would then dip my paint brush in the bowl of water (not adding anymore colour) and swept the brush over the section where I wanted to thin the colour out. Is this the "proper" way to make a watercolour, I have no clue, honestly. I just did what I had to to achieve the look I was going for. A somewhat ombre look on each sheet. The hardest part was no joke, hanging the frames. I was honestly stressing and had to do one row at a time, over an entire day. Seriously, cheaping out and not buying a laser level was such a bad idea. Don't be cheap like me, buy one! What I love best is that I can easily swap the paintings out if I ever do tire of them. I bought the frames from Walmart and they were just under $15. To save moulla, I'd probably go with the Ribba frame at Ikea (we don't have an Ikea here, so Walmart it was). 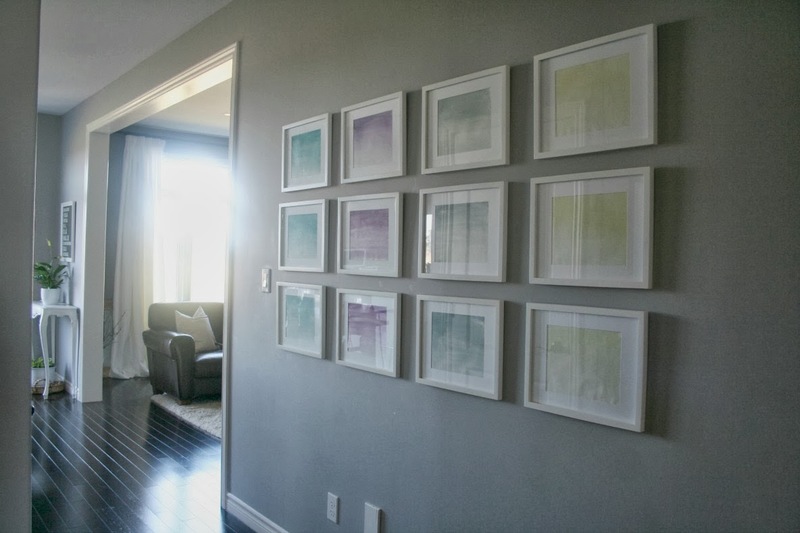 If you're not wanting to paint your own, I highly recommend Sarah's Gallery Wall paintings. I own a few and love them so much! For the paper, I'd suggest going with something on the thick side and to not use too much water. I have a few sheets that are rippling because they were over saturated. Lesson learned. If you give this project a go, please be sure to email me some photos, I'd love to see! I love how serene it looks, such a great idea! They look awesome, lots of impact & simple. Perfect if you ask me!